Religion is becoming the world's tallest temple in the city. This temple is named Chandrodaya Temple. This temple will make records in the height, as well as the hi-tech. There will be 70 floors in 700 feet high temple and also a high-speed lift. The design of this special temple has been designed with the help of US engineers, in 2022, the entire Chandrodaya temple is being built by the ISKCON Society. The foundation of this temple was laid in the presence of President Pranab Mukherjee, UP Governor Ram Naik and CM Akhilesh in 2014. The temple's structural design has been sponsored by Iscon Society, the Structural Engineering Company of America, Thornton Tomasetti. The construction of the temple has been entrusted to Gurgaon and Noida Company. The foundation of the temple will be deep within 55 meters of land and its base will be 12 meters high. It will probably be completed in 2022. The special thing is that despite being the tallest building, it will be an earthquake. The temple will also be a theme park along with a cultural center. This temple dedicated to Sri Krishna will be in thirty acres of land. A special attention is being taken about the greenery around the temple. The temple will be surrounded by forests all around. In total, there will be 12 forests, including date forest, tree forest, basil forest, and funding etc. 700 crores will cost a large number of devotees coming from abroad to see such a large temple. Keeping this in view, parking has also been done. There is a large parking space for the temple, in which 4500 cars will be standing. According to the people associated with ISKCON, the temple is being built at a cost of 700 crores. On the first 3 floors of this 70-story building, there will be the gallery, telescoping facilities and other facilities for visitors on Chaitanya Mahaprabhu and Radha, other than the temple of Krishna Balarama, which will be helpful in connecting nearby Dharmic sites. The lift will be 8 meters per second, and it will run straight even when the building is crisp. This temple, being built in the traditional Dravidian and city style, will be the most modern temple in 200 years, in which the Goddesses and deities will be able to exhibit by 4D techniques. Not only this, an environment of natural forests will be created around this temple and Yamuna G will also have a pattern of designing such as boating. Apart from this, there will also be the library and other means to know the life stories of Lord Krishna images. In addition to underground parking in 10 acres, in addition to the construction of road construction and other facilities, a total of 500 crores will be spent in the construction. 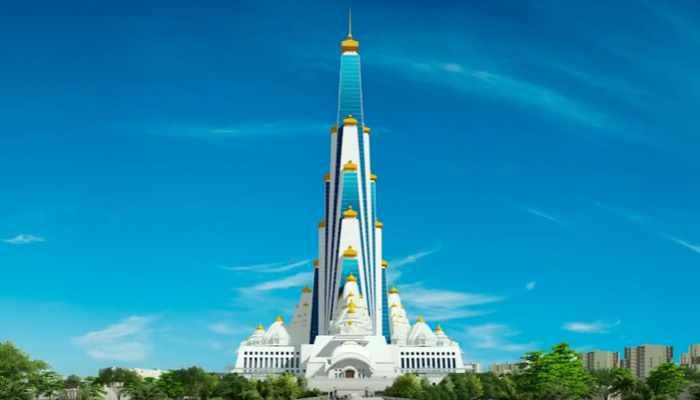 The construction of this temple will be completed by 2022 and it will be known in India as the world's tallest building, Chandrodaya Temple at Vrindavan. In 2014, UP Chief Minister Akhilesh Yadav laid the foundation stone of this temple and on this occasion, Hema Malini worshiped the foundation. The special point of this temple is that it will not only be the height but also the depth so that the foundation is as strong. The building will be about 55 meters deep and its base will be up to 12 meters, while the depth of Burj Khalifa, the world's tallest building in Dubai, is only 50 meters. Therefore, the depth of the Chandrodaya temple is also 5 meters higher than the Burj Khalifa. It is also being strengthened in terms of natural calamities and an earthquake of more than 8-meter scale will not be able to harm it. Apart from this, glass and other materials used in it will also be earthquake resistant. With a total of 511 pillars, this temple will be capable of bearing 9 million tonnes and will be able to withstand the storm of 170 km intensity. Chandrodaya temple is a constructed temple dedicated to Lord Krishna in Vrindavan, Uttar Pradesh. The foundation stone of Chandrodaya temple was done by President Pranab Mukherjee on November 16, 2014. Chandrodaya temple is being built at a cost of 300 crores. Upon completion of its construction, Chandrodaya temple will be the tallest temple in the world. The second feature of the Chandrodaya temple is that 12 artificial forests will be made in 26 acres. This temple is being built on 62 acres of land, including 12 acres of parking and a helipad. It is being made according to the scriptures, as in the scriptures, 12 forests of Brajandal have been given. The main purpose of this temple is to use the Nagar Vaastashasti and the modern musical style. This temple will be filled with green trees, plants, and pools, and will also make the mountainous mountains (mountains) and waterfalls. Vrindavan Chandrayaan Temple is a temple dedicated to Lord Krishna in Vrindavan, Uttar Pradesh, which is currently under construction. It is being built at a cost of Rs 300 crore at the cost of the Bangalore unit of the ISKCON. The main adorable god of this temple will be Lord Krishna. The most distinctive attraction of this temple is that the total height of this magnificent temple will be about 700 feet (213 meters high (which is as high as a 70-story building), due to which it will be the tallest temple in the world. Apart from its skyscraper, the second special attraction of this temple is that 26 acres of land in the temple premises. 6- A telescope has been placed on the top floor of the temple, from which the entire Vrindavan view can be seen. 10- There is 30 acres of wooded area around the temple where the bears of Banjara have been built. 11-There is a tower in the temple with its peak, panoramic view of Mathura, Agra and Yamuna rivers can be seen. 12- Night Safari will also be organized by the temple organization.